Check out Tobi's Catalina Pearl High Waisted Denim Skirt Tell em' with pearls. 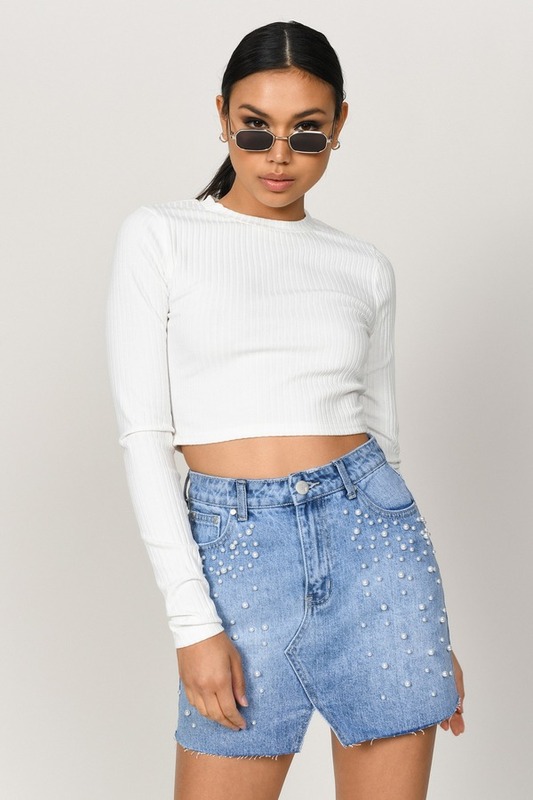 The Catalina Pearl High Waisted Light Wash Denim Skirt is a pearlescent beauty. This split front skirt features a high waisted construction, slightly frayed hem, and gorgeous pearls scattered along the front. This embellished skirt will do wonders at your next outdoor show. Tell em' with pearls. The Catalina Pearl High Waisted Light Wash Denim Skirt is a pearlescent beauty. This split front skirt features a high waisted construction, slightly frayed hem, and gorgeous pearls scattered along the front. This embellished skirt will do wonders at your next outdoor show. Light Wash modeled on a size 26.